MSI Power. The extensive GT family includes some of the most powerful notebooks out there with plenty of configuration options. We take a closer look at the performance of the US model in our GT70 update review. The MSI GT70 2OC Gaming Notebook is very capable, especially when it comes to powering the latest Direct X 11 titles. 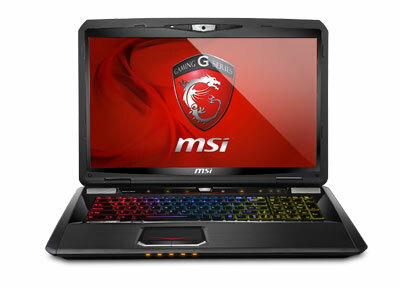 MSI have paired a powerful 8 thread Intel i7 processor with the Nvidia GTX770M graphics card. This combination delivers smooth, consistent frame rates, even when enabling high image quality settings in demanding titles such as Batman Arkham Origins, and Battlefield 4. Positive: Powerful performance; quality build; stylish design; comfortable keyboard; set of communication; efficient cooling system. Gaming notebooks are all the rage, and MSI has come out with one particular device to outdo them all. A notebook features a matte 17 inch screen and matrix display options allowing up to four different displays at once for maximum multi-tasking during gameplay. In view of such a large screen, we expect the hardware to be more than capable of handling the amount of data. It comprises a 4th generation Intel Core i7 processor in combination with a powerful Nvidia GeForce GTX 770M graphic cards, which can be further accelerated with Nvidia GPU Boost 2.0. However, due to the hardware, the laptop is bulky with a height of 2.88 cm and a weight of 3.75 kg. So lugging it around will take some effort. Gaming usually means that a lot of heat is produced. The laptop has a single fan with Cooler Boost 2 technology, which is supposed to provide 15% more cooling power than normal fans and works more silently. For online gaming enthusiasts, there is the Killer DoubleShot connectivity feature that combines Ethernet and Wifi for superlative Internet data flow with the ability to handle several data streams at one time. Other gamer centric features include a keyboard by SteelSeries with backlight and speakers by Dynaudio with integrated subwoofers and Audio Boost options to please even the most demanding of players.